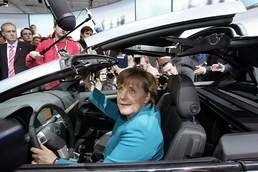 German Chancellor Merkel is trying to drive Opel into Magna's arms. BERLIN (Reuters) -- German Chancellor Angela Merkel said on Thursday a German task force would decide this weekend on bids for Opel, but could not rule out a difference of opinion with the carmaker's parent company General Motors Co.
"We want a quick decision, and have a clear preference," Merkel said at a conference in Berlin. Merkel said the government still preferred the bid of Canadian-Austrian car parts groupr Magna International Inc. over a competing bid from Belgian private equity firm RHJ International.